Saint Mark's Flies Bibio marci mating on the Chasselas grape. The grape leaves are just bursting out of their tight little buds. I'll be able to make dolmades in a couple of weeks! Hurrah! 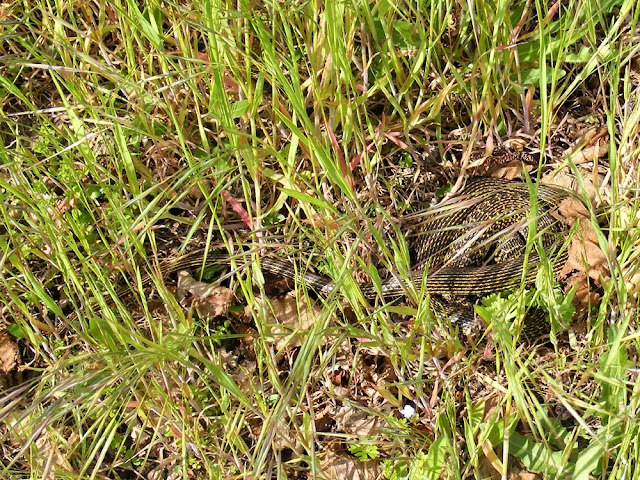 I nearly stepped on this Western Whip Snake Hierophis viridiflavus, snoozing in the sun. It didn't notice me for several minutes. I could see it breathing. When it realised I was there it glided off under the 'to be burnt' pile. It was about a metre long. 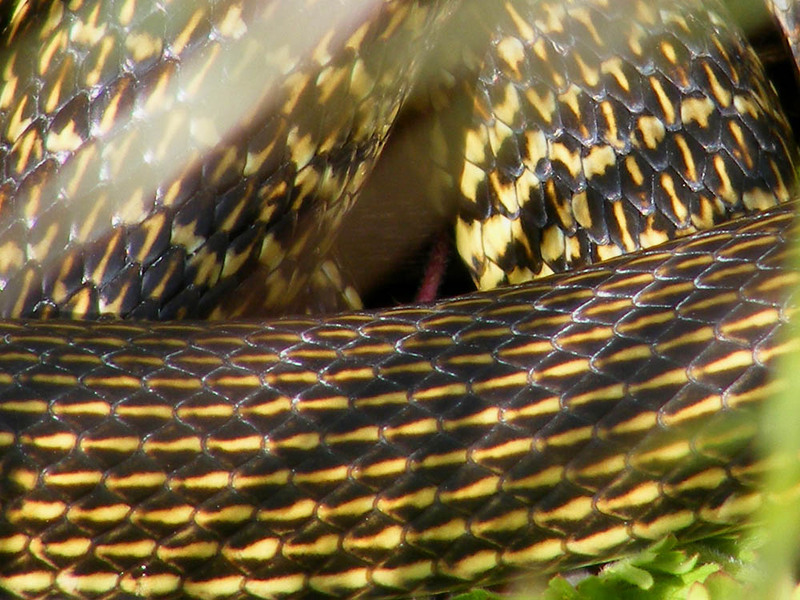 A closeup of the scales, showing the yellow patterning. Every Western Whip Snake seems to have a different pattern and they vary considerably in design and colouring. This one is a particularly stripey one. Quite a few of the Early Spider Orchids Ophrys sphegodes are out. The flowers can vary quite a bit in the form and patterning of their labellums (bottom petal).Click on the link to Loire Valley Nature if you are interested in comparing a number of individual plants. Apple blossom is the most beautiful of the fruit tree flowers I think. Plus it is most pleasantly scented. 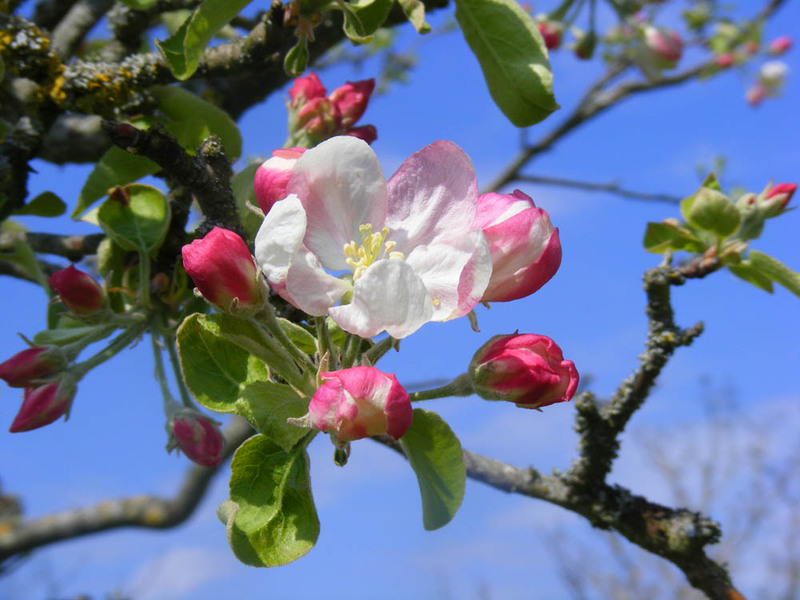 Some of our apples don't have much blossom, but others are covered. Like many fruit trees they tend to naturally alternate a heavy crop with a light one. Because we have 8 trees and 6 different varieties we always get something. This one is Granny Smith. 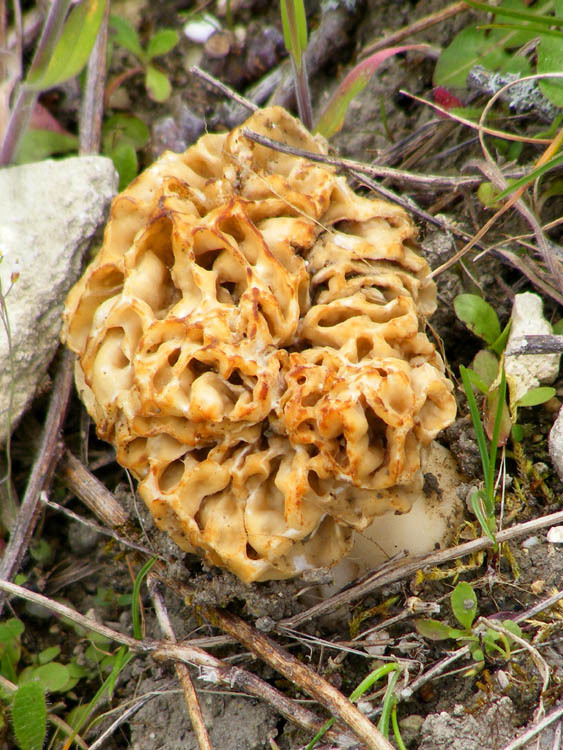 Cheating here -- this morel was photographed 10 days ago. Several appeared in the potager this year, but they don't come every year. This is typical of morels. As a French friend says, they are infidèle. Pesticide News: The EC has voted to ban the use of neonicotide insecticides on certain flowering crops (such as canola and sunflowers) throughout the EU for a trial period of 3 years. This is the result expected by environmental lobbyists after the European Parliament failed to pass this ban. For those of you mystified by the technicalities of how the European Union works, the European Parliament is where all the elected Members sit, debate and vote. Above them is the European Commission, made up of a College of Commissioners and the horde of civil servants that administer the legislation and policy, usually abbreviated to EC. The College of Commissioners is made up of 27 representitives, one from each member country. They are appointed by the European Council and ratified by a vote from the Parliament. The European Council is made up of the heads of state of each of the member countries. It is the EC that holds the real power to affect peoples' lives here. Their remit is to work on behalf of the EU as a whole, not for their individual countries. This is not the first time they have overridden the Parliament in an agricultural environmental matter (GM crops are banned in Europe because the EC voted against them). In practical terms in France this ban will have no impact, as France has already banned these chemicals. 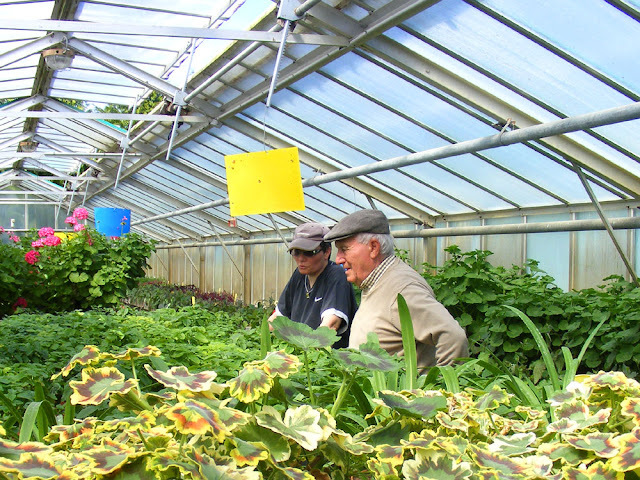 The Association de Botanique et Mycologie de Sainte Maure de Touraine was lucky enough to get access to the greenhouses which produce the plants used by the City of Tours for its many magnificent floral displays. A dozen or so of us were met at the entrance to the Bois des Hâtes in Chambray-lès-Tours, where the greenhouses (les serres in French) are hidden away. In total, they produce, from seed, 450 000 plants a year as well as nursing the previous year's perennials and overwintering some of the topiaries and standards (many of which are very old – at least 50 years). 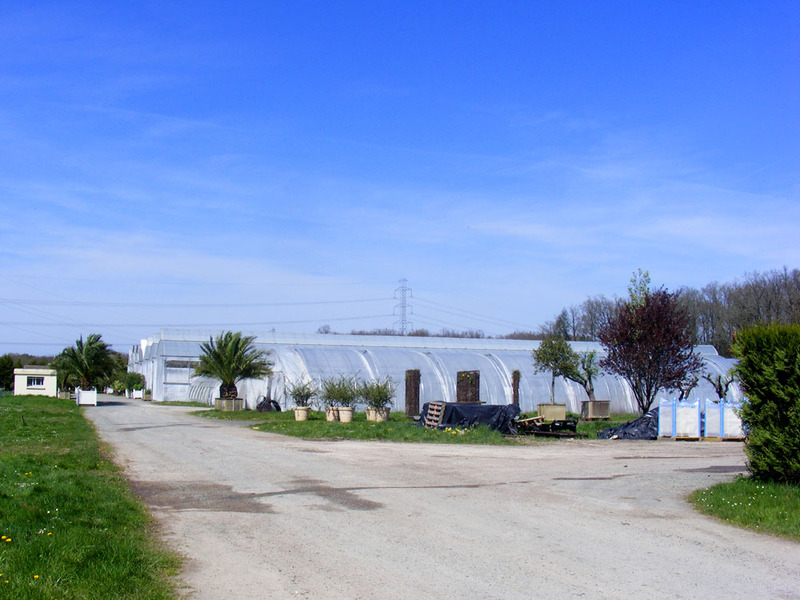 Our first sight of the greenhouses, which along with the outdoor holding facility here, cover 4 ha. Sylvie (below left), the gardener who gave us a guided tour, with Maurice, who organised the visit from our end. The yellow and blue sheets hanging from the rafters are biocontrol sticky plastic traps. Yellow is for whiteflies, aphids, leafminers, thrips and fungus gnats, blue is just for the last two. The density here suggests they are using them for monitoring and light control. 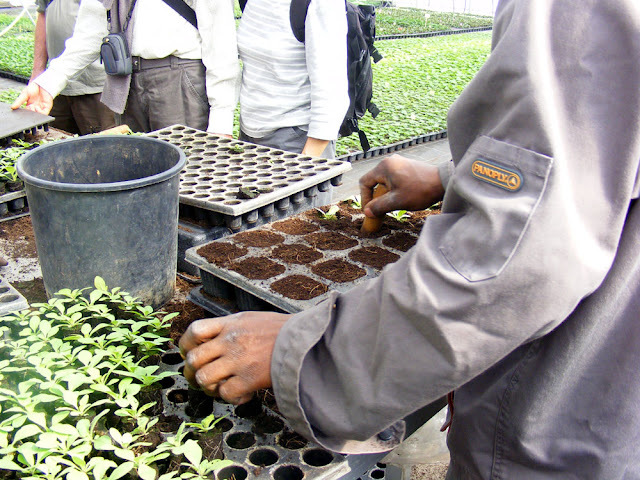 Sylvie gave several incredibly adept demonstrations of how to prick out tiny seedlings with barely two leaves, using only her biro to both extract the plant and make a new hole for it, never touching the stem or roots of the seedling. She was an absolute fountain of information about how the greenhouses are managed, and sometimes I got lost when I missed a word or two, then wasn't able to make up the ground to understand the gist. The work is extremely physical, with the plants being manhandled many times during their lifespan. Some planting of fine seed is mechanised and parts of other processes, but mostly it is gardener muscle power, seven days a week. One gardener comes in on the weekend and waters everything on their own. More biocontrol -- this time a card which has the remains of parasitised whitefly pupae stuck to it. 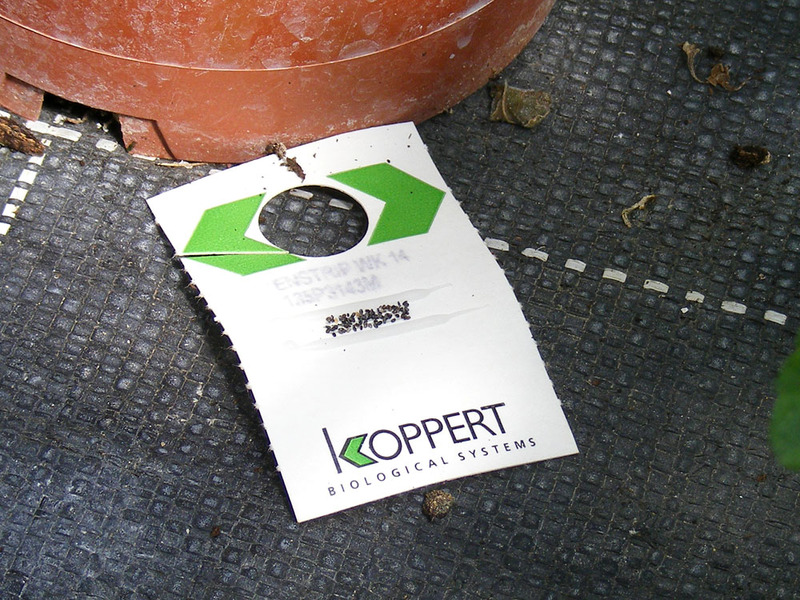 These cards, with the unhatched parasitised pupae, are introduced to the greenhouse so that the parasitoid wasp Encarsia formosa hatches into the greenhouse and controls the resident whitefly by parasitising them in turn. I really struggled to decide which photo of lovely foliage to put on the blog. 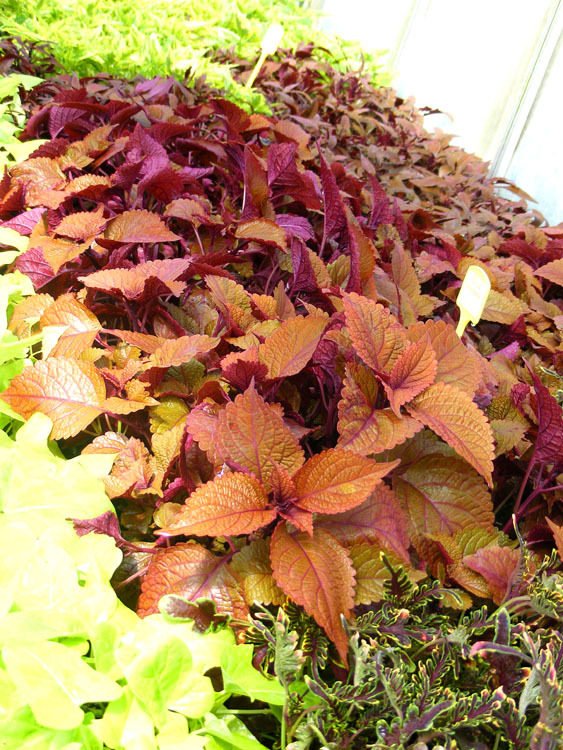 In the end I chose this interesting copper and raspberry coloured plant, but can't tell you what it is now. 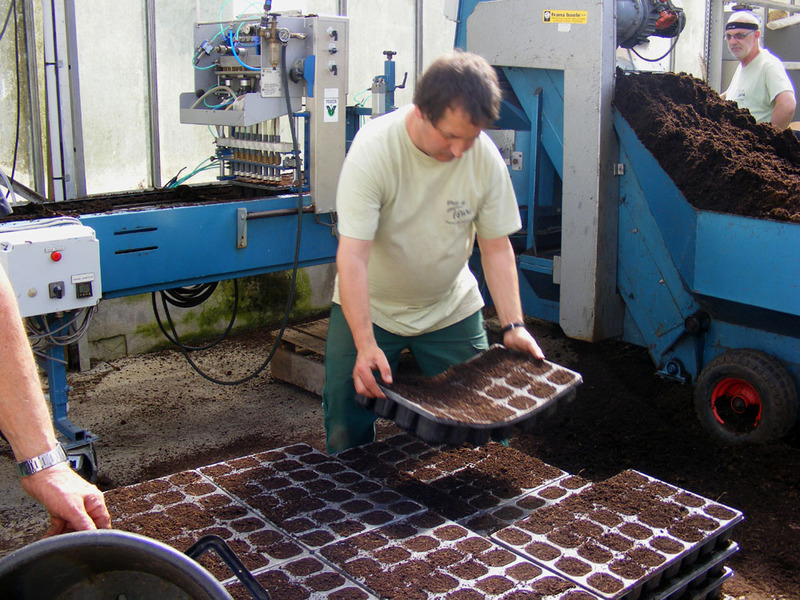 Filling the cell trays with potting mix was a real production line. The potting mix was a combination of peat and coir, sometimes with vermiculite added. The endless task of potting on. The gardener engaged in this task said he loved it and could do it all day. To push the plugs out of their tiny cells they have a spike board. The tray is pushed onto the spike board, and up pop the plugs, ready to be plucked by the leaves and plonked in the perfectly sized hole created by the custom made dibber. Espaliered hornbeam trees, heeled in to a pile of soil and leaf litter, awaiting their spot in this year's public display. As always with places like this I was momentarily startled by the quantity of plants that to me are noxious weeds and alien invaders, but to Europeans are beloved and pretty garden plants (I'm thinking of lantana and asparagus fern, for example). Other plants being carefully nurtured in the pseudo-tropical conditions of the greenhouse over winter to burst out into colour in the summer are the sort of thing I had providing shade along the front of the verandah in Australia, planted in the ground and out in all weathers (bougainvillea). Some plants, which I have seen in public planting displays and admired, but never been able to identify have now been revealed as things like sweet potato and streptocarpus. That was a surprise -- I would have thought both much to tender to put outside even in the summer here. Ultimately, the most useful thing I got out of the visit was an addition to my vocab. I learnt that un massif (des fleurs) is a flowerbed. I'd been wondering what the word for flowerbed was, but never got round to asking. There was so much use of this word during the afternoon of our visit that I eventually twigged! 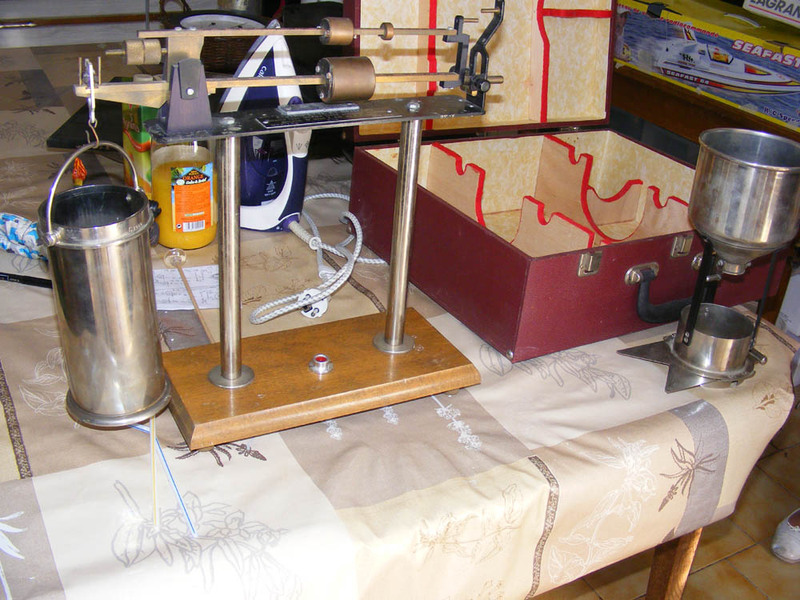 This blog post is going to form the basis of the outing report in the botany club newsletter. Jeannine, the secretary, spotted me taking notes and gleefully pounced on a 'new victim' (her words) suggesting I contribute to the newsletter. Either she will translate what I've written into French, or I will give it a go. 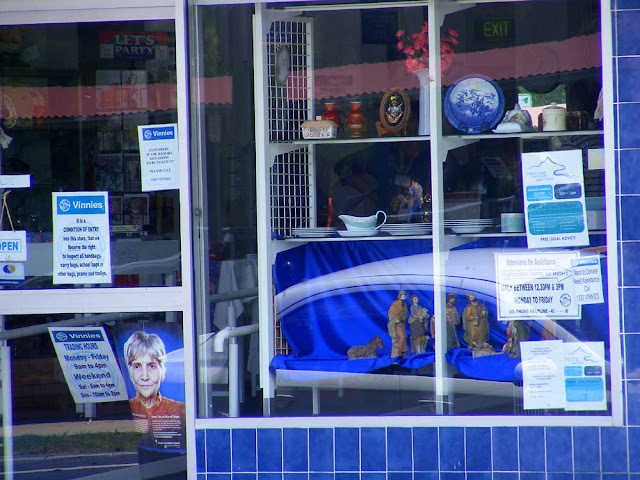 Vinnies is an Op Shop. There are Op Shops in most towns in Australia. 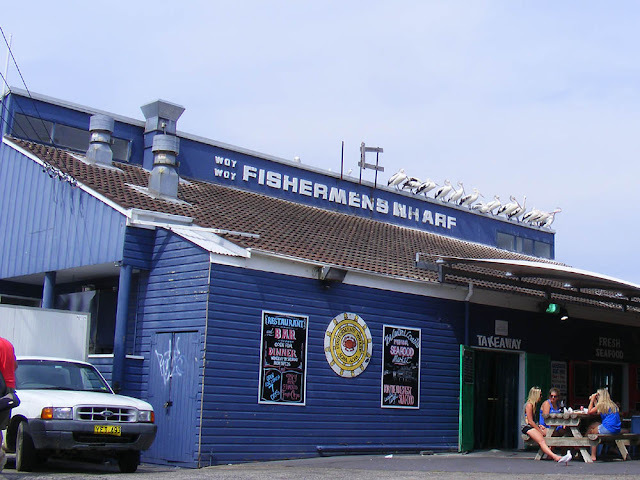 This one's in Woy Woy, on the coast just north of Sydney. 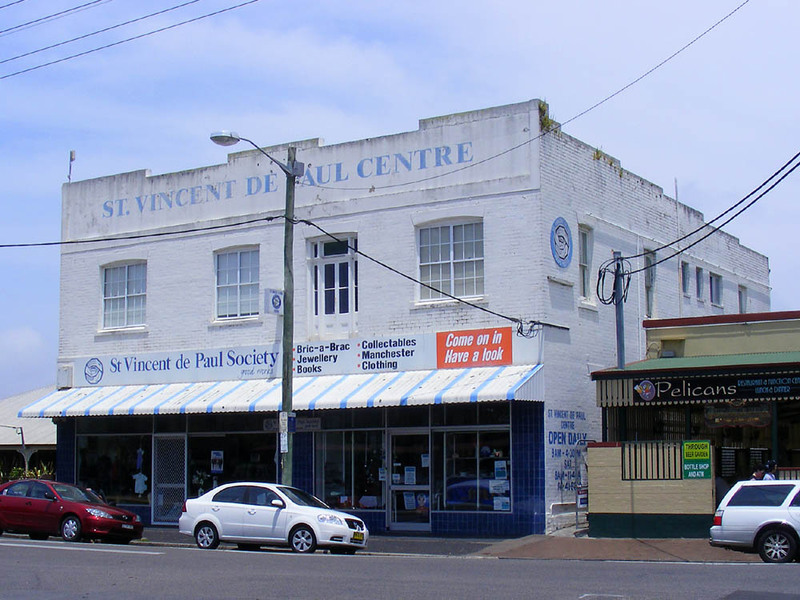 Vinnies is short for the Society of Saint Vincent de Paul, a worldwide Catholic charitable aid organisation run by volunteers. It was originally a French organsisation, founded in the mid-19th century by a young French lawyer, to work in the slums of Paris. Nowadays it operates in slightly different ways in different countries, but always its focus is the poor, the needy and the homeless. 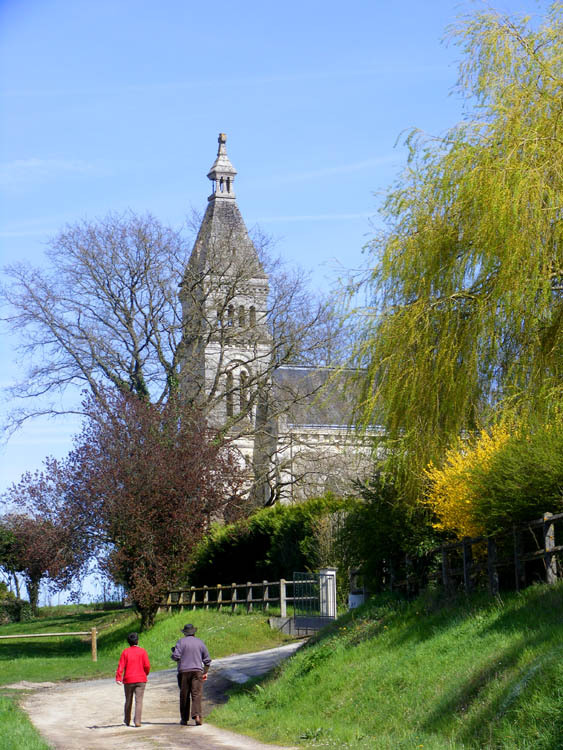 We have a local connection in the Touraine to the early days of the Society, as Léo Dupont, a lawyer living in Tours, was a significant contributor to the work and funds of the Society. He became known as the Holy Man of Tours and his house is now owned by the Catholic Church and has become a place of pilgrimage. 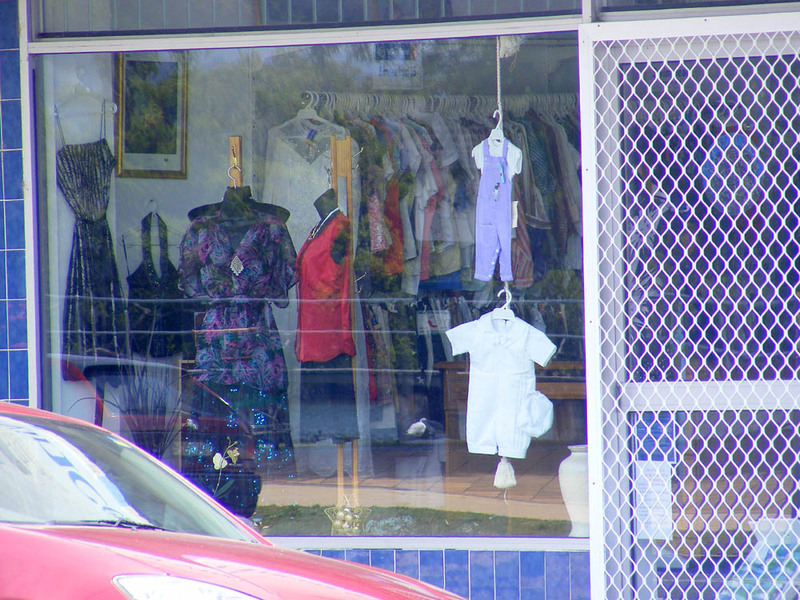 Op Shop is short for Opportunity Shop, or what would be called a Charity Shop in the UK. Funds raised from the sale of the donated goods go towards funding Vinnies charitable activities. There is no exact equivalent of this type of outlet for donations to charity in France. The closest is Emmaüs, which does not have shops, but instead has periodic gigantic sales in large venues such as trade exhibition centres. Colin and Elizabeth describe attending one on their blog In and Around Braye-sous-Faye. Update: Apparently Emmaüs does have retail outlets -- see comments below. If you are saint you get lumbered with a lot. First you have to go through the trauma of a horrible death, and then, like as not, folkloric tradition will associate your name with some sort of pestilence. (male to the left, female to the right). In Saint Mark's case, it's a fly - it could be worse... 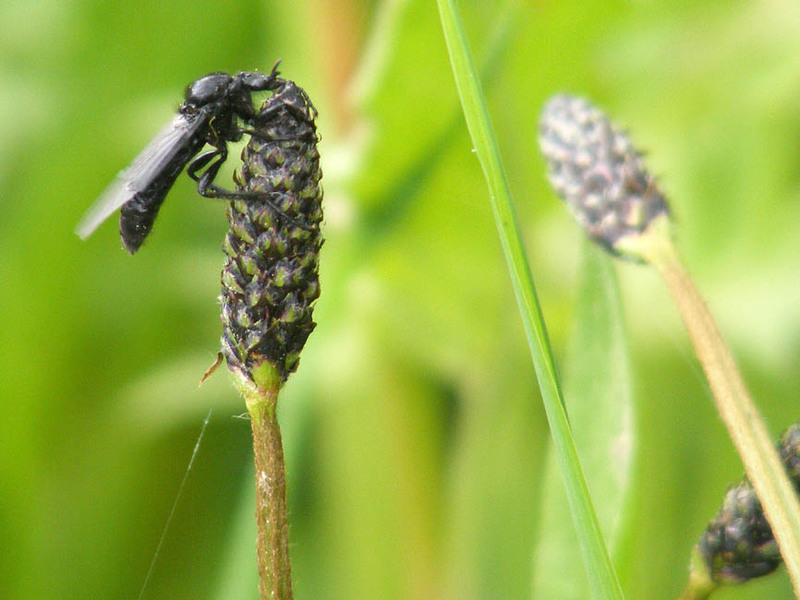 The saint's day was yesterday, 25 April, and as luck would have it, the date coincides with when a rather dopey black gnat emerges in large numbers. Bibio marci is a large primitive fly, glossy black all over and very hairy. They drift about above the grass with dangling legs, in a distinctly lacklustre fashion, searching for mates. 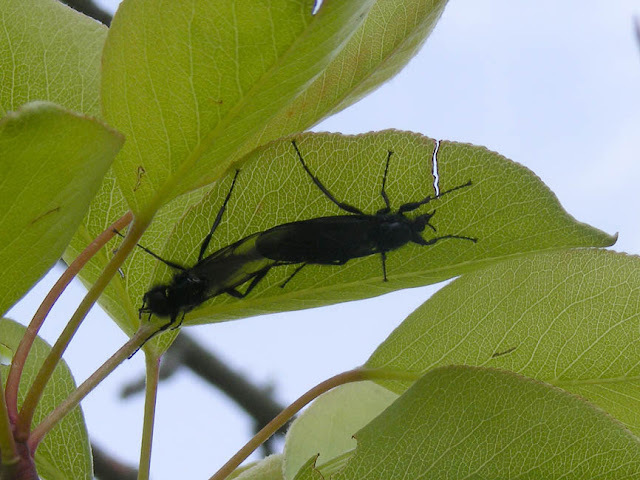 They don't bite or sting or carry any sort of disease, but they can be a slight nuisance just from their sheer numbers if you are outdoors in late April/early May. A female rests on a plantain bud. 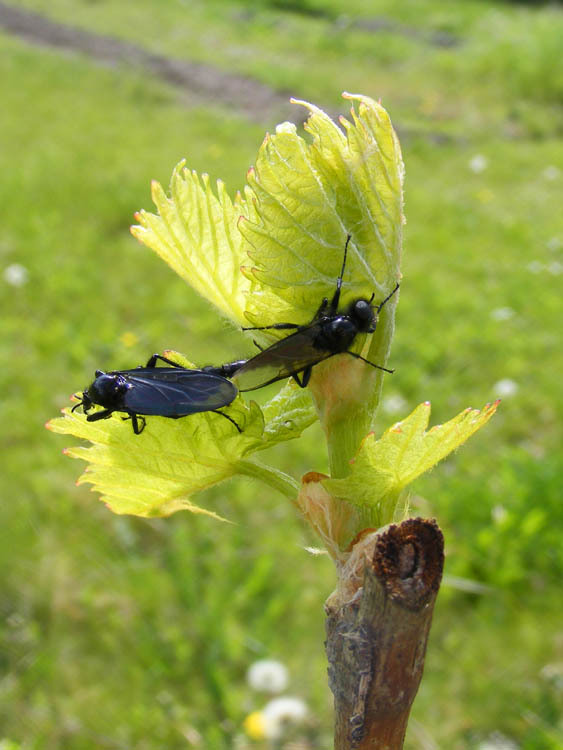 Saint Mark's Fly, as it is known, is easy to identify because of its size and because it is completely black. Males are smaller than females, but have huge hairy eyes. Females have much larger bodies but miniscule pin heads with tiny eyes. Last Anzac Day you may remember I wrote about my Great Uncle Eric, younger brother of my paternal grandmother, who was killed in the Second World War when the unmarked prisoner of war ship taking him to Japan was torpedoed. Since then I have discovered that one of his nephews, my second cousin Simon, who is a journalist, wrote an article a few years ago about Eric and the effect his death had on the family. Eric is represented by quotes from his many letters home, coming across as a caring, well educated stoic, remarkably mature for his age. 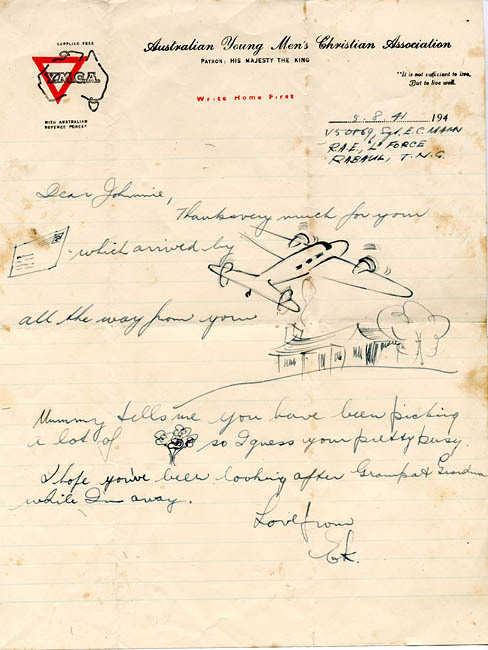 Letter from Eric Mann to his nephew, my father. Johnnie is my father, who dreamed of becoming an architect like his aunt and uncles (sadly, for reasons unconnected to the War, this didn't happen). You can read Simon's full article here. Above is a letter he sent to my father from Rabaul before the Japanese invaded. My father would have been very nearly 5 at the time it was written. It's a really charming little letter, with its sketches to make 'young Jocko', as my father is referred to in another letter, feel special. He was probably still a bit young to be able to read on his own so Eric has drawn him some pictures. No wonder he treasured it all these years. The bunch of flowers, incidentally, will be violets, which my grandparents grew on a commercial scale, supplying florists in Geelong. Today is Anzac Day in Australia, and in France it is the national day of remembrance for those deported to the forced labour and death camps in the Second World War. Our property is an old grain merchant's premises and recently we met Gérard, one of the sons of the last person to run it as a grain merchant. Gérard lives in Sainte Maure de Touraine, so when I went on an outing there with the botany club, I called in on him and his wife after the outing finished. He had dug out a few photos for me, and had all sorts of paraphenalia associated with the business to show me. It was fascinating, and he and Marie-France were so generous to show it all to me and allow photographs. They look at the blog from time to time, and I warned them that their family history will get broadcast to the world. 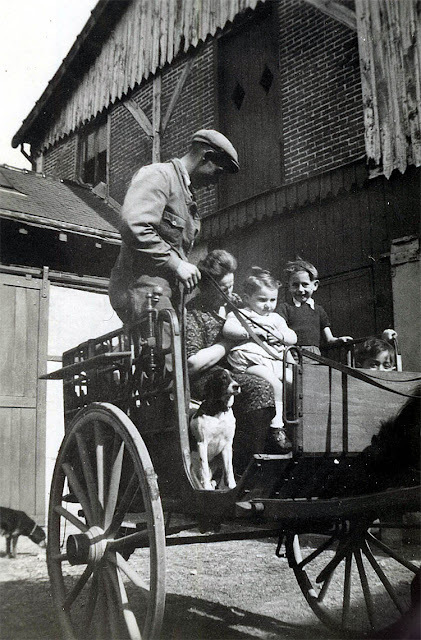 Gérard's father and grandmother in a buggy out the back. 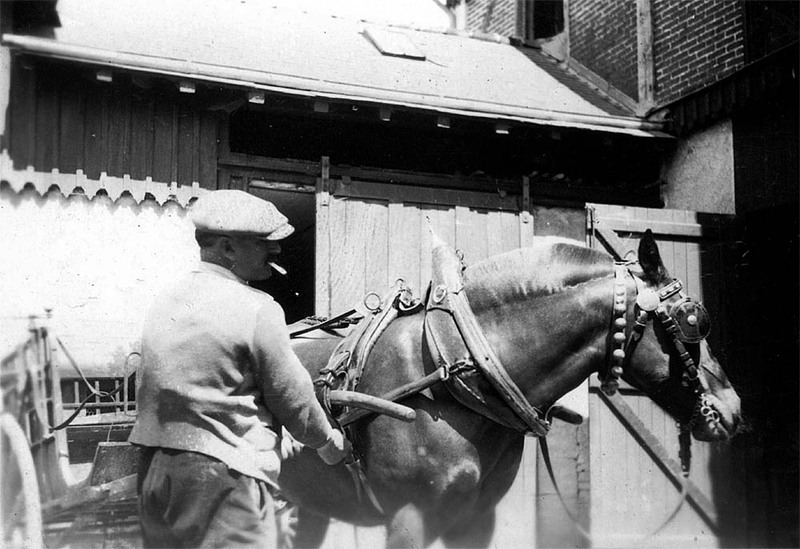 The stables (now ours and neighbours garages) have barely changed. I think the toddler on granny's knee is Gérard and the other children are two of his siblings. One of the pair of working horses Gérard's father kept. These horses were much admired in the district as always being in tiptop condition and beautifully turned out. On only our second visit to the house we were told about them, and many local people remember them with fond nostalgia. The horses, like most of their kind in this area, were chestnut with flaxen manes and tails (I think the breed is Comtois, although our friend Bernard refers to them as Percherons). Gérard doesn't recognise the man in the photo, but the setting is the same as the previous one. Gérard's great-grandfather's account book. 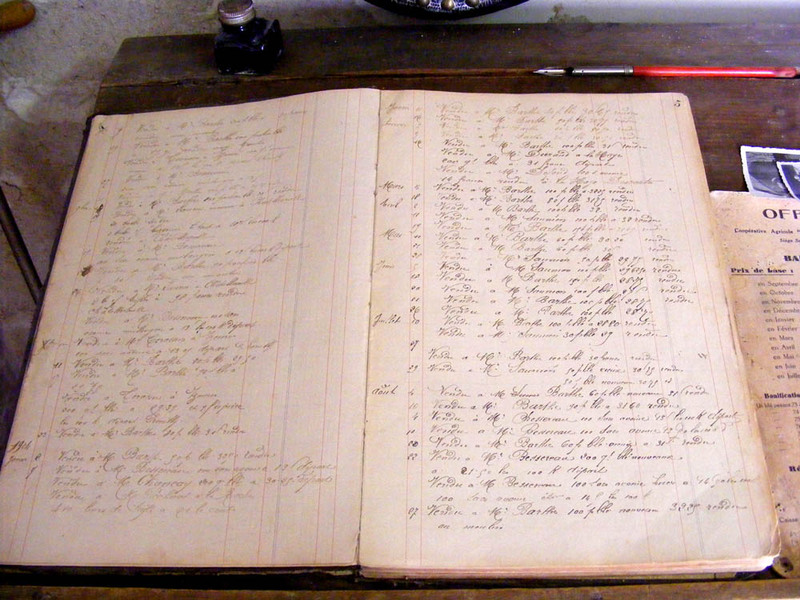 The entries say things like 'July 10 Sold to Mr Barthe 100 ?s[acks] wheat at 28.80. Paid.' 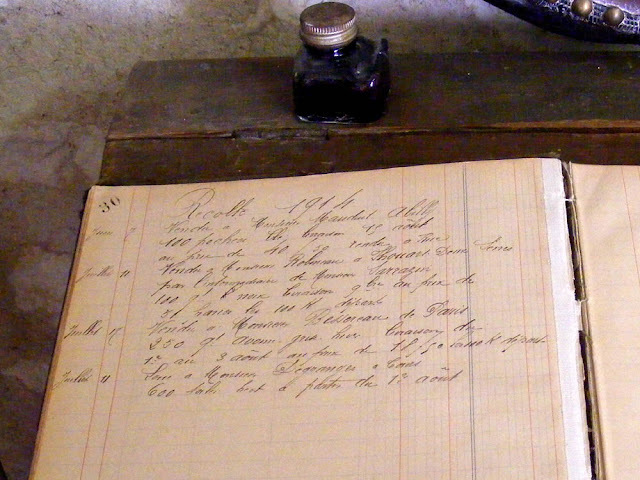 In other entries the wheat is measured in quintals (50kg according to Marie-France, 100kg according to Larousse) and there is an additional note saying something like 'to be delivered dry in 8 months'. at the price of 40F[rancs] 50 paid ? 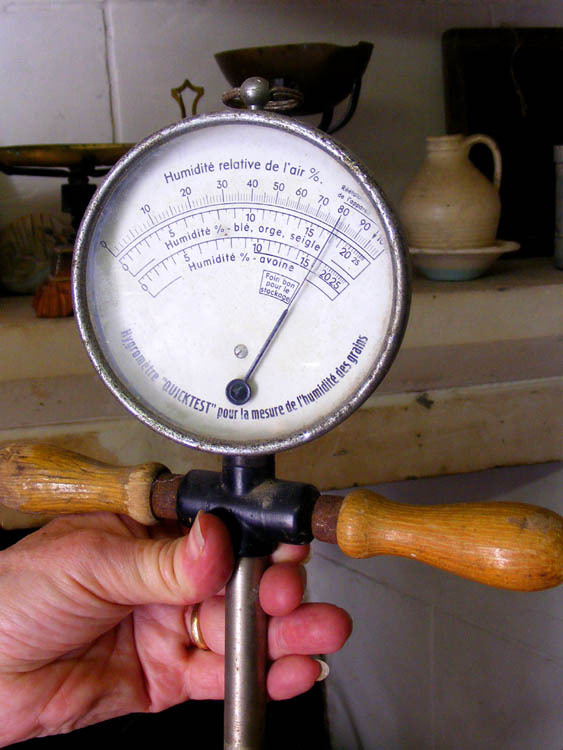 A humidity metre, which appeared to be in good working order. Its dial is reading about 82% Rh, and since we were standing in the cellar entry, I'd say that was fairly close. It has a long spike, perforated along its bottom quarter, and you plunge it into the grain to measure moisture levels. A kit for measuring the density of the grain. 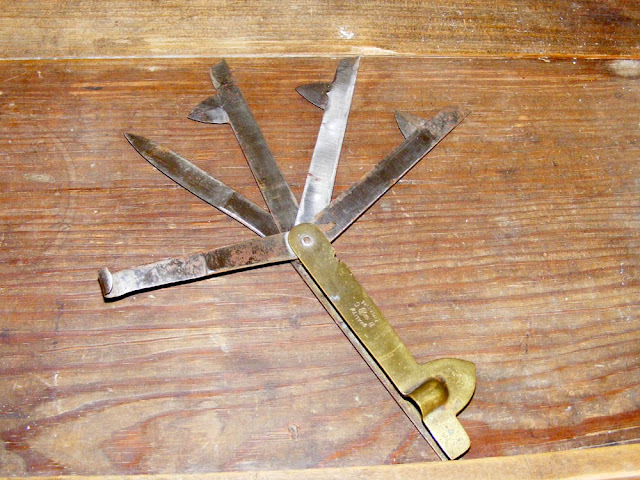 5 points to anyone who can correctly identify the tool below. What is it called (2 points) and what is its function (3 points). Neither Simon nor I got it right and had to be told what it was for, and I had to look up what it was called. Answer to the Quiz: It is a fleam, used for bleeding horses. Here is a link to a very good article about the practice. 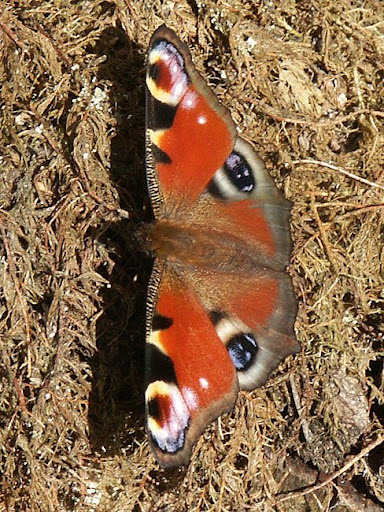 Nature News: I managed to do my first butterfly survey for the year yesterday, of the Chaumussay transects. 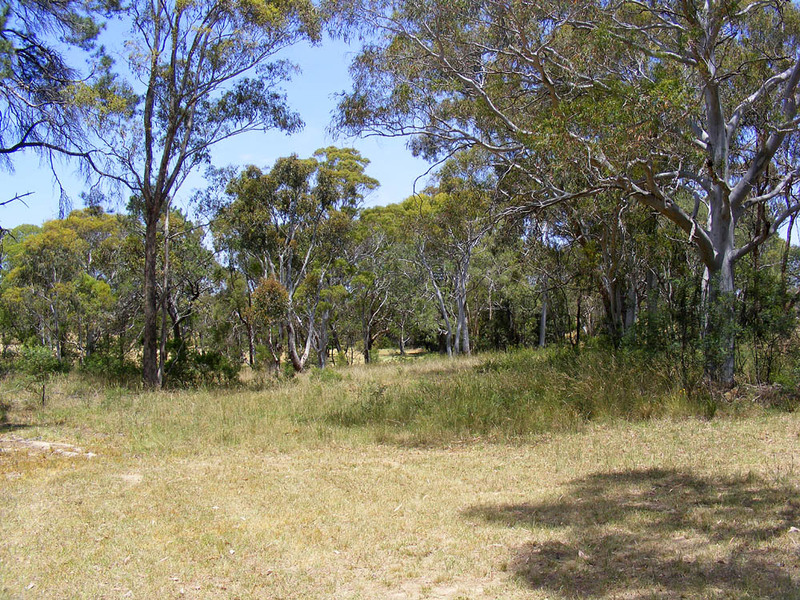 This survey patch concentrates on calcareous grassland and arable land. The weather was overcast, but not that cold, with realfeel being about 17°C and no breeze at all. I saw Wood White, Brimstone, Holly Blue, Orange Tip, Violet Fritillary, Dingy Skipper, Wall and Peacock. 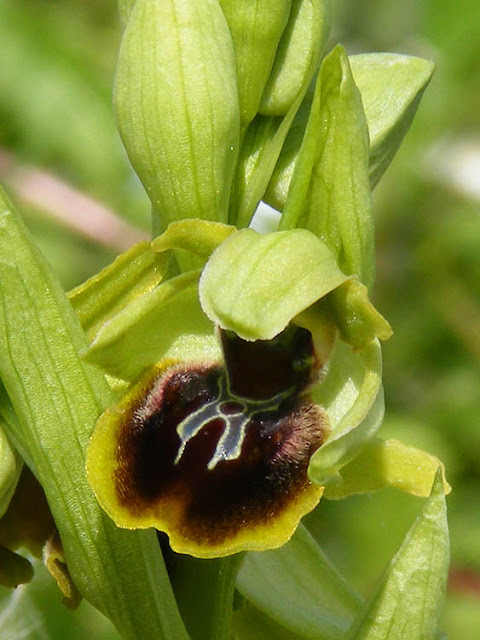 The first orchids are out, with Early Spiders in the orchard and Ladies at Chaumussay on the dry limestone slopes. There are Early Purples and Green-wings around too. In the Aigronne Valley the Snakeshead Fritillaries continue to flower, after being flattened by a deluge a couple of weeks ago. Forty six years ago, my parents migrated from England to Australia. I am sure this film had a lot to do with it. The film was made in 1966, just as my parents were deciding to make the big change, and looking at the film I can see exactly why any sane person would take the steps they did. I am sure they must have seen this film, it's the sort of thing Australia House would have sat all prospective immigrants down to watch. Breast of lamb and I haven't had a good relationship in the past. I once bought a breast of lamb from the Ginger Pig in Borough Market when we were living in London on a single wage and fairly broke. Even when we were impecunious I bought our meat at the Ginger Pig or direct from a couple of trusted producers at farmers markets, because supermarket meat in the UK in those days was such a disappointing waste of money. Breast of lamb, pork liver and several other cuts of meat had been suggested to me as cheap and tasty, and as the man next in the queue at the butcher's said to me 'Blimey, you are really skirting around the fringes of the beast, aren't you!?' Sadly, the instructions for cooking the breast I had also received resulted in no meat to speak of and gallons of unappetising fat and sinew (not the Ginger Pig's fault, I hasten to add, but my lack of experience with this challenging cut). On the plus side, the ideas for extending liver paté I continue to use to this day. Nevertheless, when the wonderful Skint Foodie, who also shops at the Ginger Pig, posted about cooking breast of lamb and it coincided with locally produced lamb breast appearing in SuperU, I was encouraged enough to give it another go. The only recipe most people know for breast of lamb is à la Ste Menehould, where the meat is slow cooked, boned, then cut into batons that are crumbed, grilled and served with a piquant sauce. This has always seemed like a messy business to me, so I was quite interested to try the Skint Foodie's approach to getting something edible out of a lamb breast. I'm happy to report that his rolled pot roast style worked very well, producing a delicious rich gravy and perfectly acceptable slices of mostly meat. 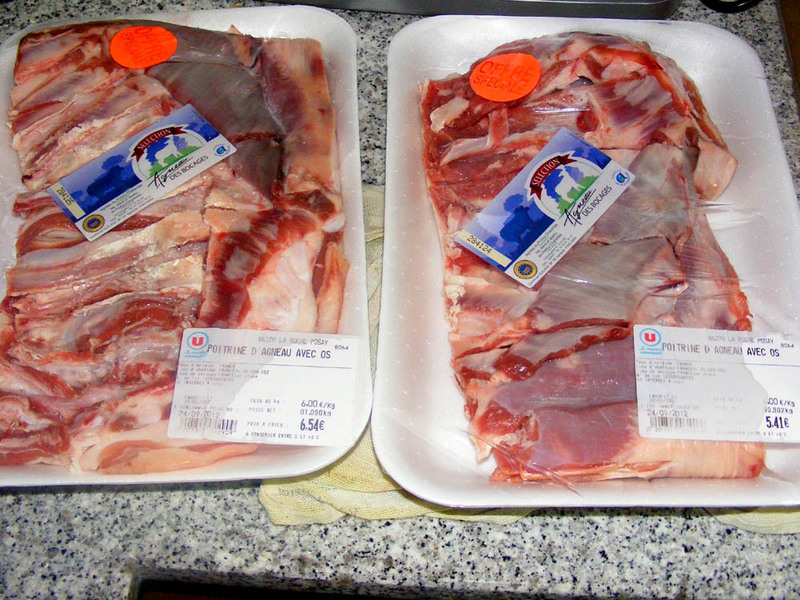 Sadly I didn't get to do ribs, as the lamb I purchased came with the ribs already removed, tant pis. Today is Earth Day, part of an American environmental movement lauched in 1970. This year's focus is on climate change and themed 'The Face of Climate Change'. 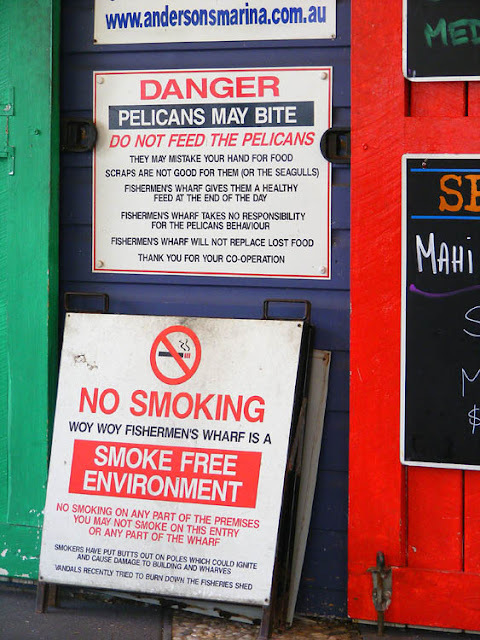 The movement is about more than just this one day though, and is involved in projects worldwide to educate about the environment and support sustainable life practices. This year the Center for Biological Diversity is offering Endangered Species Condoms as their contribution to raising awareness. This is a continuation of a series they began several years ago. I'm assuming they have become very collectable. More examples, from a few years ago, can be seen here. Australian Pelicans Pelecanus conspicillatus are widespread and locally common. 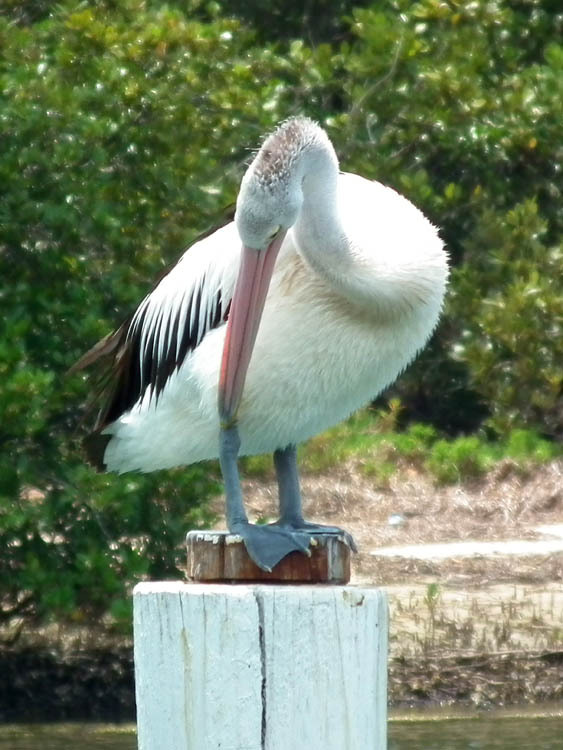 They occur both at the coast and on larger, open, inland bodies of fresh water. 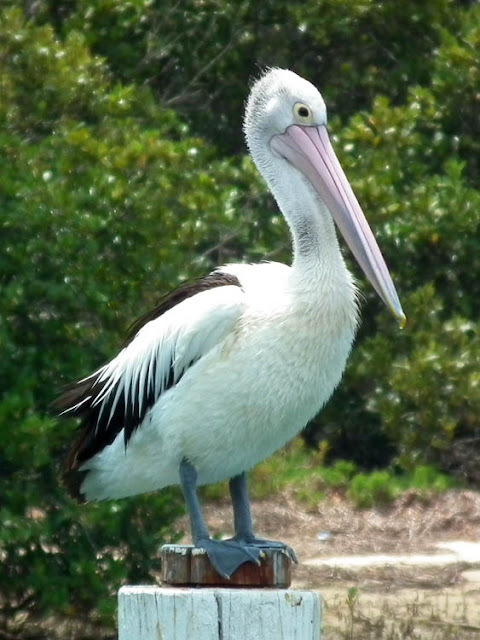 These were photographed at Woy Woy, on the coast just north of Sydney. 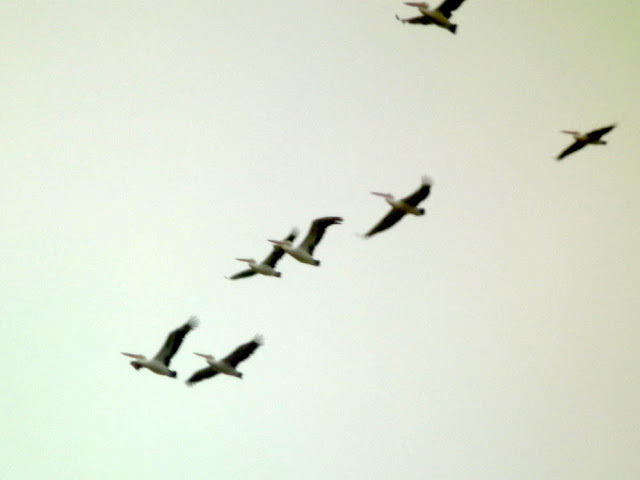 They are a magnificent sight in the air. These were photographed from the train going from Canberra to Sydney. My sister, brother-in-law, his mother and I went orchid hunting one day in November last year when I was visiting. We targetted the old cemeteries in the area, famous for their native Australian orchids, but we were a bit late in the season, so weren't all that hopeful we would see anything. These were the only flowering orchids we found all day. However, luck was with us at Dalton, the very first cemetery we stopped at, about 80 km north of Canberra. 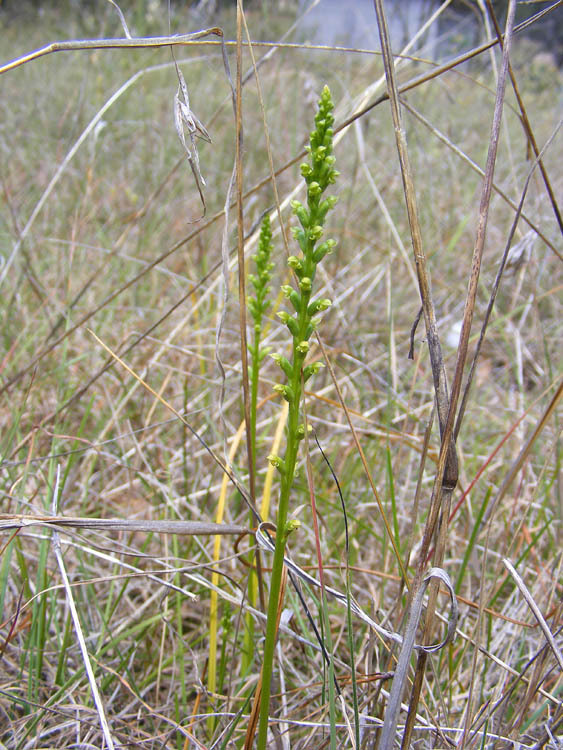 I spotted a couple of spikes of tiny pale greeny white orchid flowers in the grass which we identified as Common Onion Orchid Microtis unifolia. They were a new species for Kathy and John, so that was nice too. A close up to show the many tiny greenish flowers. It occurs in eastern and southern Australia, growing in a wide variety of habitats. 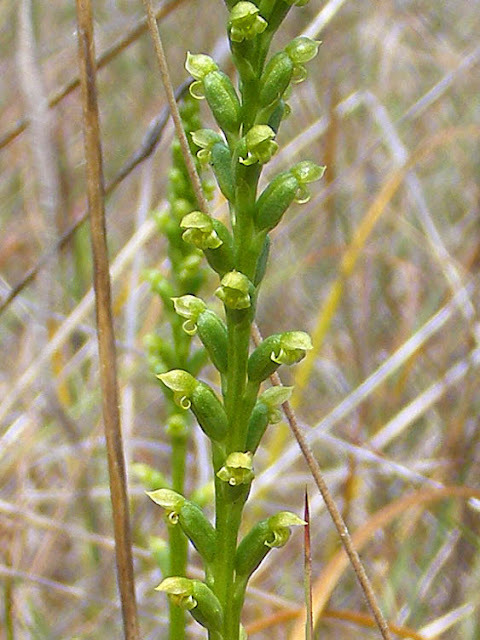 The scientific name means 'small eared single leaf', as presumably the flowers are thought to look like little ears. The habitat the orchids were growing in. 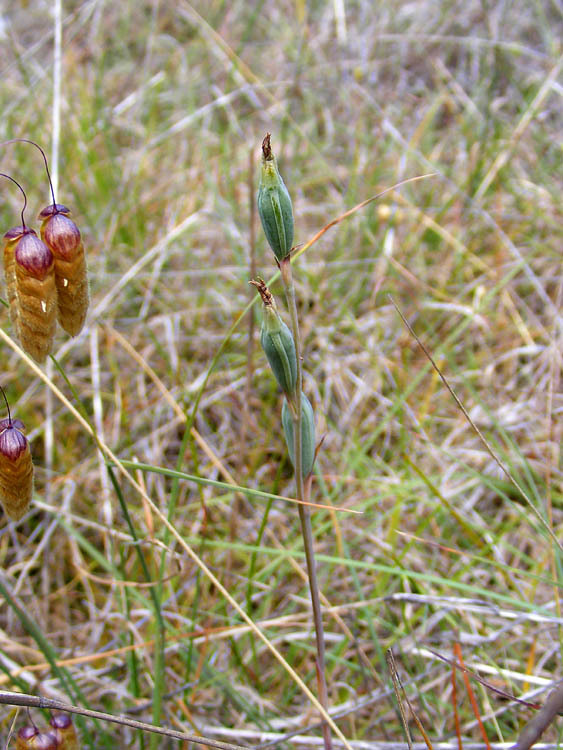 Sun Orchid Thelymitra sp seed pods -- they had all finished flowering, but if you want to see what the flowers looked like, go to this blog, written by a local person who went on a botany outing to the cemetery only a few weeks before we were there. 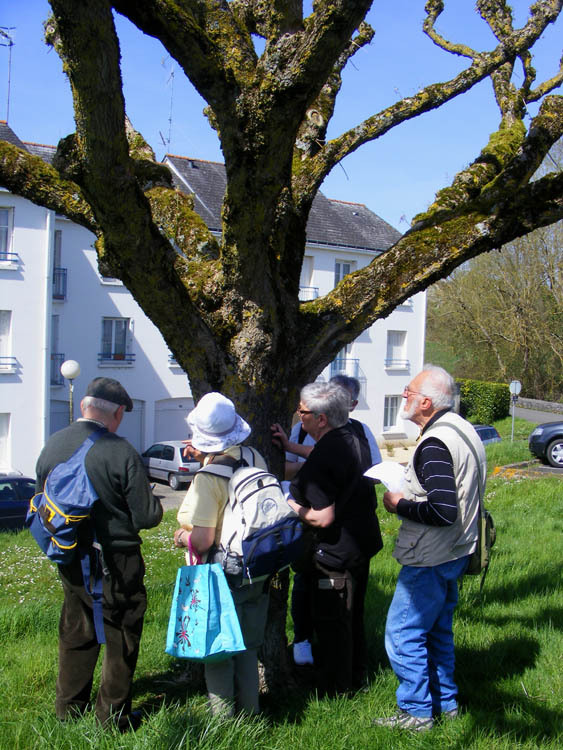 On Sunday 14 April the Association de Botanique et Mycologie de Sainte Maure de Touraine had an outing to study the mosses and liverworts (together known as bryophytes) of Sainte Maure. They are quite an esoteric field, and I know next to nothing about them. However, I went on last year's moss outing and enjoyed it, and it is always a good opportunity to practice my French. Plus the day was forecast to be absolutely beautiful, and it lived up to the predictions. Our first moss of the day, found at the lavoir. It is called Wall Screw Moss Tortula muralis and has smooth hairs with white tips. It grows on mortar, concrete, limestone or base rich walls. The new president of the club is Christian. 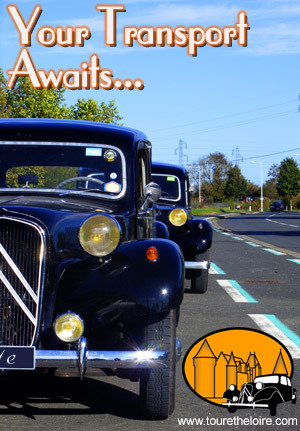 He took it upon himself to act as my passanger navigator, which is just as well, as I find Sainte Maure completely confusing geographically, and always get lost there. 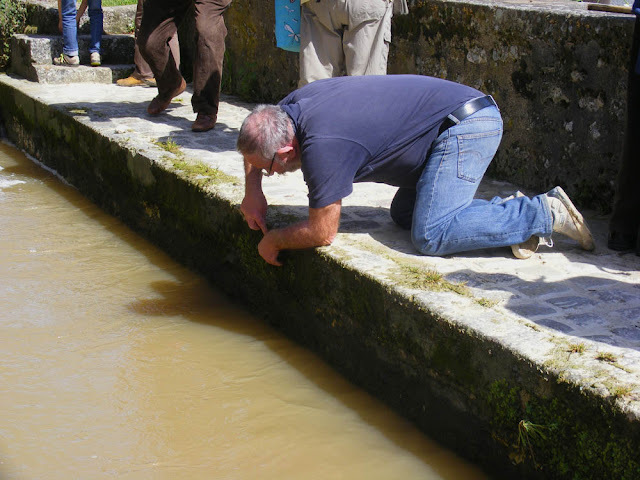 Here he is taking a sample of liverwort from the lavoir. The liverwort he was after is Crescent Cup Liverwort Lunularia cruciata, and I photographed the sample. 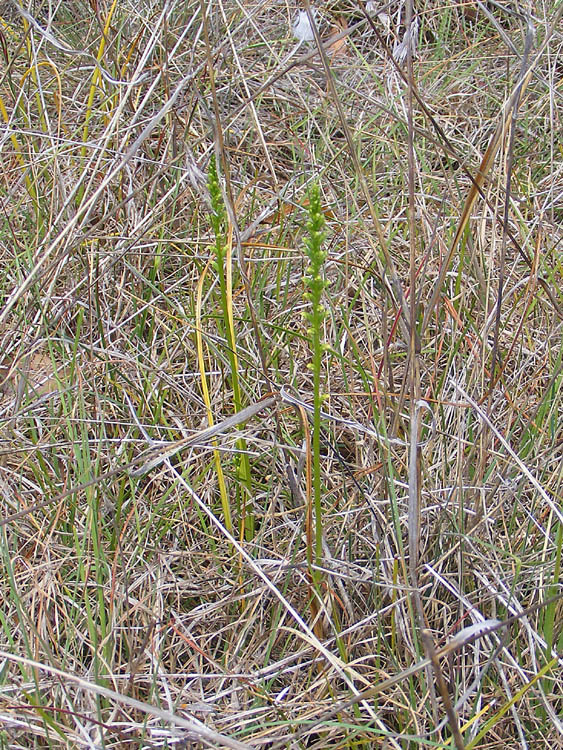 This species has a pattern caused by air chambers visible on the surface and crescent shaped reproductive bud cups. It grows in greenhouses, paths, garden borders and lawns. After the lavoir the group checked out some trees near the carpark across the road. At one stage the police cruised by, but simply nodded politely and went past. We wondered if someone living in the housing estate had called them because there was a bunch of weird people gathering around each of the trees one after another and performing strange rituals. Christian spent most of his time at this point reminding people to watch out for the dog turds. 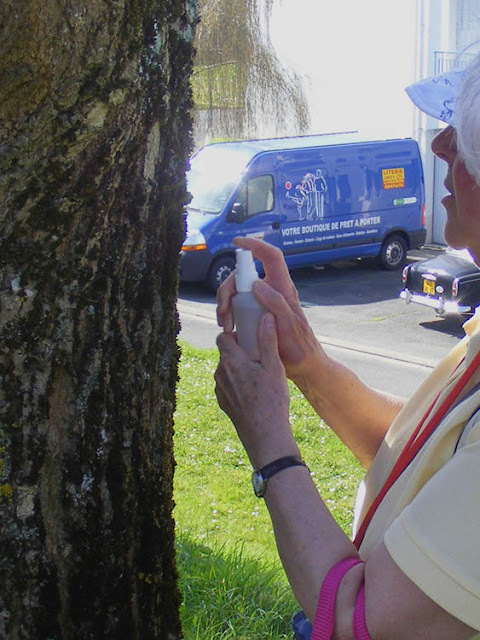 Mosses look completely different when they are dry, and can become unrecognisable, so Jeannine carried an atomiser which she deployed when necessary to moisten a sample for identification. We were surprised at how dry some of the mosses were, considering how wet the weather has been. Sainte Maure is on a plateau though, and may have had less rain. Our next stop was the 19th century chapel, built on the remains of a 14th century chapel, dedicated to the virgin saints Maure and Britte. The water from the nearby sacred well is said to cure psoriasis of the scalp. 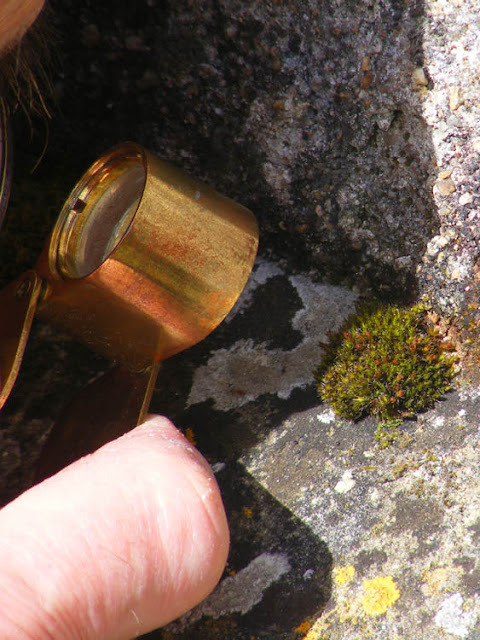 On an exterior wall of the chapel we found a tiny button of a rather rare moss for this area, Thickpoint Grimmia Schistidium crassipilum. Here Paul is taking a good look. 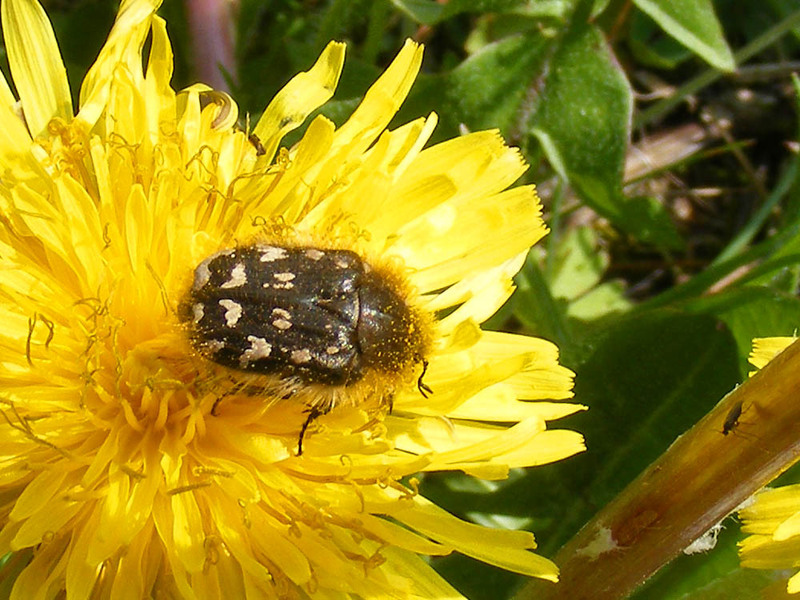 We didn't ignore other subjects that came our way, identifying any plants of interest and noting the insects. This is a Glow worm larva Lampyris noctiluca, found on the roadside bank near the chapel. 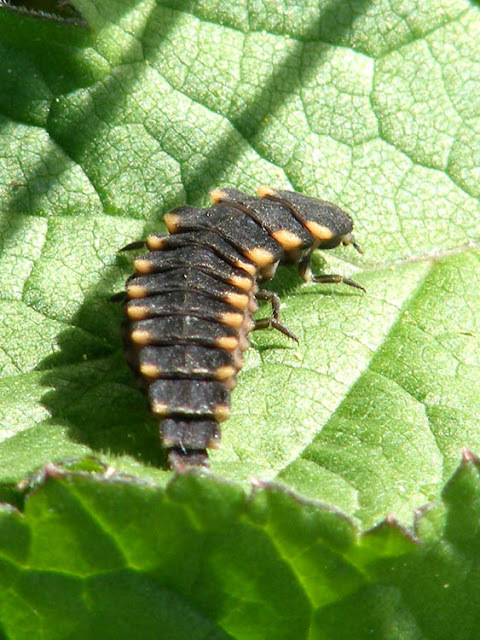 They look rather like a large ladybird larva. 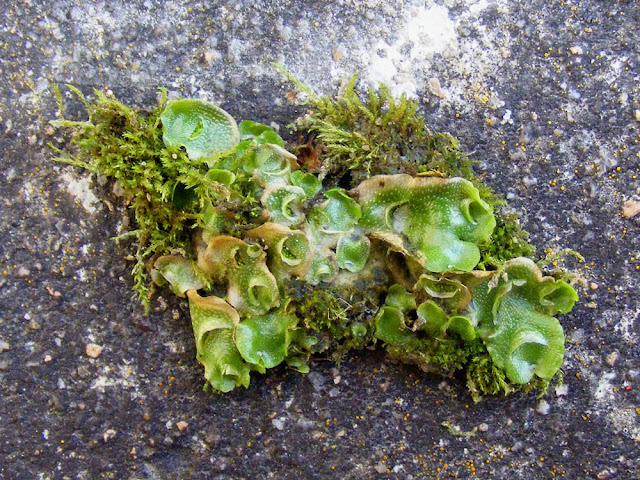 I'm pleased to say that I remembered having seen the Crescent Cup Liverwort last year, and I may remember a few of the mosses we saw this year. 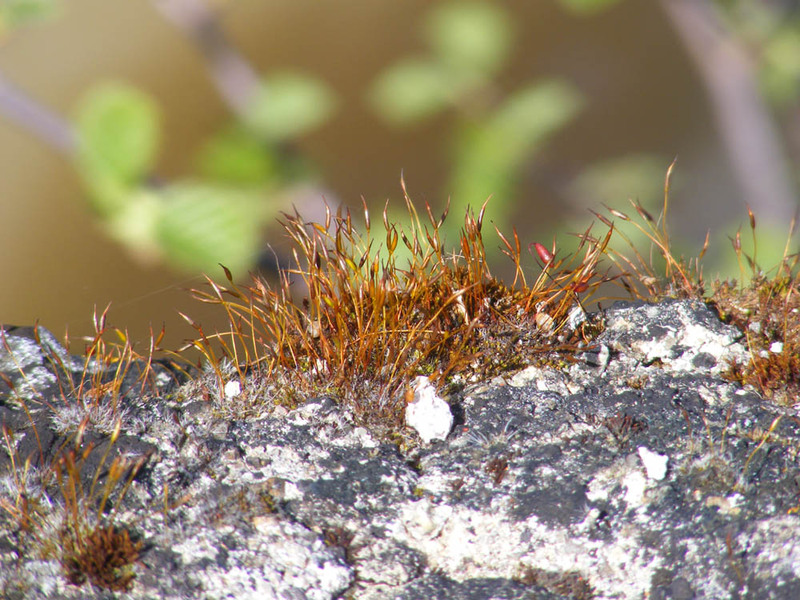 In any event I now have photos of 15 properly identified mosses that I can add to Loire Valley Nature in the fullness of time. 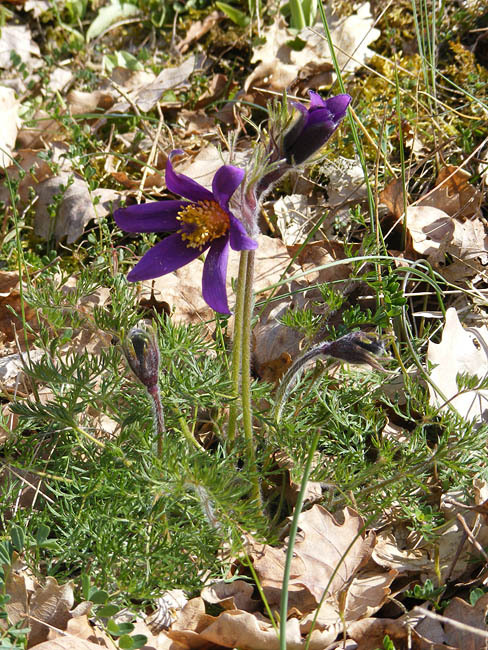 Can We Save the Pasqueflower? 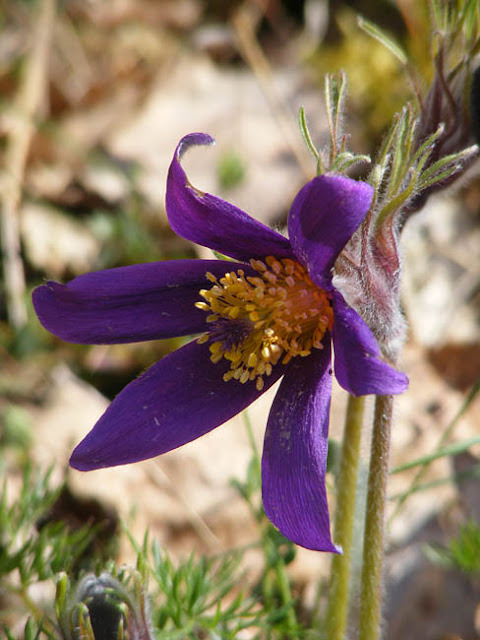 The Pasqueflower Pulsatilla vulgaris is rare and protected throughout Europe. Once upon a time it occurred on the steep slopes of limestone buttes of the Touraine, where it thrived amongst the closely cropped grass of the sheep pasture, carpeting the ground with a purple wash in the early spring. These sites have now been abandoned by the farmers, who concentrate on broadacre cereals and vines on the lower slopes. Modern farmers no longer run sheep on this marginal land that is too steep to plough and it is simply left to get rank and ultimately be covered in scrub. The Pasqueflower clings on in pockets where the rabbit population is high enough to keep the grass down. 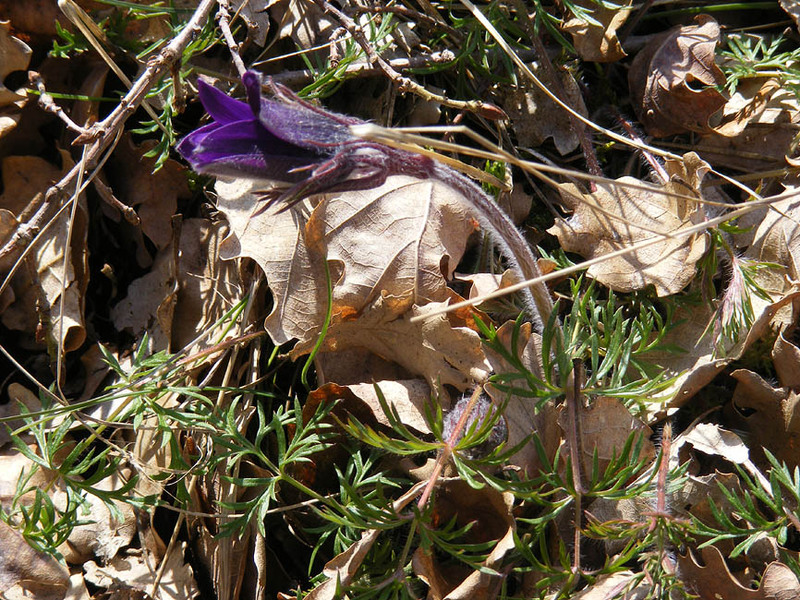 If the grass gets too high the Pasqueflowers very quickly die out. Today there are only 9 sites in the Touraine and 4 in the Brenne where Pasqueflowers can still be seen. 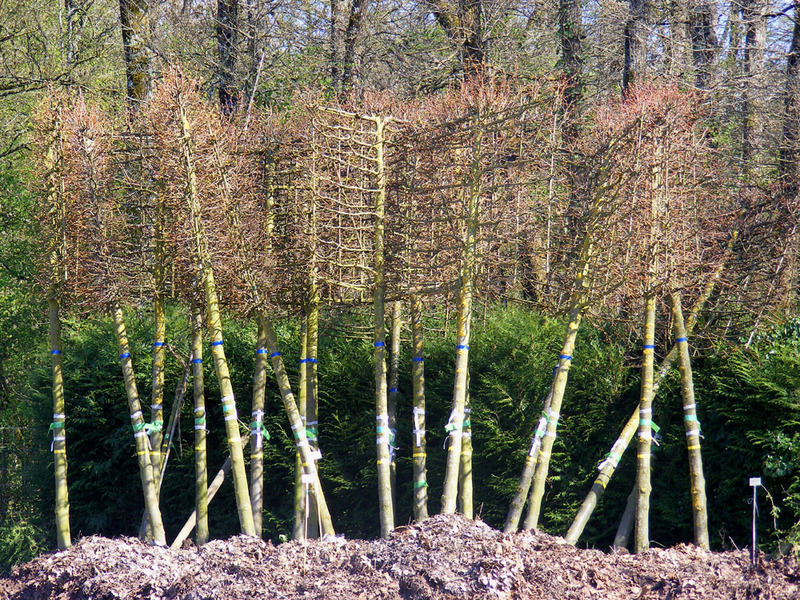 By far the most significant sites in the area for the plant are the Puys du Chinonais. Sensitive management of the sandy limestone grassland sites such as suit the Pasqueflowers is not easy to achieve alongside modern farming practices. Ideally the site should be grazed in the winter, but this requires fencing, a means of loading and off-loading livestock, water and a flexible supply of livestock (known in the UK as a 'flying flock'), which comes in for a few weeks then goes off to another site, in rotation. Also ideally, during the flying flock's residency the site must remain fully accessible to the public, many of whom will come here from Chinon to walk their dogs (and as any sheep farmer knows, town bred dogs and sheep are an unhappy mix). Few of the local farmers now have any animals at all, nor probably the time and inclination to set up temporary pastures for the small flocks that would be necessary. We can continue to rely on the wild rabbits to do the job, but this comes with the more general risk of damage and erosion due to their burrowing. Rabbits also dig up or eat quite a few plants, as do voles. Sites can be mechanically mowed from time to time, but this is always the tool of last resort, much less successful than grazing and requiring even more man hours than shepherding as all the cut grass must be raked and removed to prevent its nutrients recycling back into the poor soil and over enriching it. 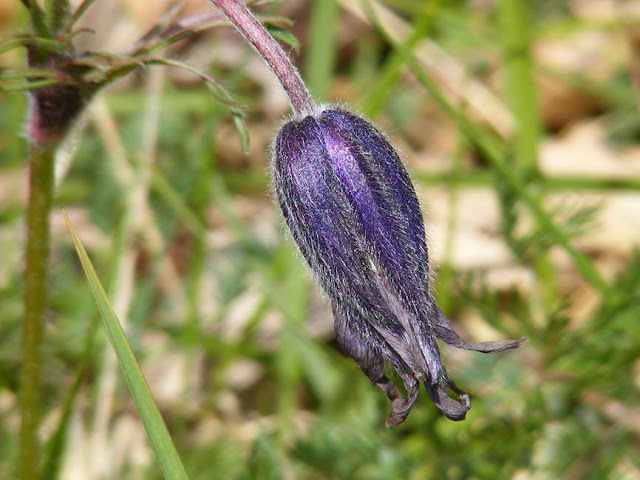 To add to the Pasqueflowers problems, there is now a concern that sites can become eutrophic - that is, too fertile and ultimately, too acidic - from environmental conditions originating outside the sites. 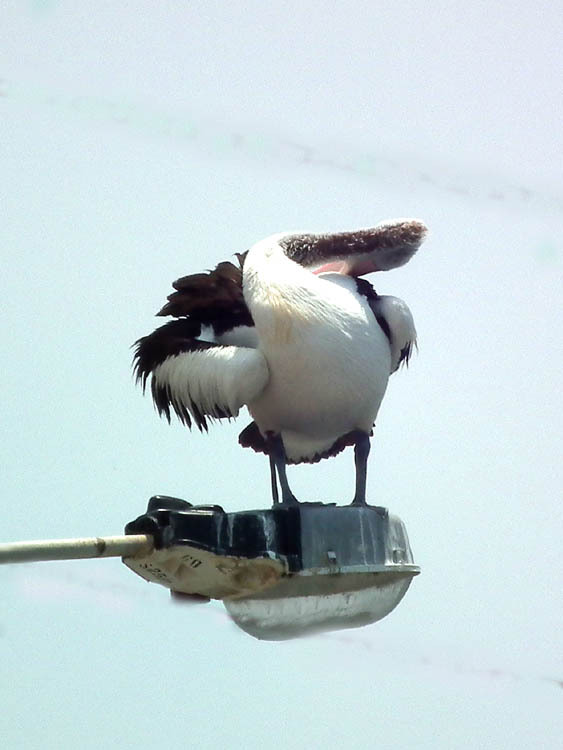 The species likes low fertility and low competition. Many nature reserves are under threat from a problem that seems impossible to control - the nitrogenous deposits from car exhausts (nitrogen is the N in the NKPS code on your bag of fertilizer) as well as agricultural fertilizer runoff. 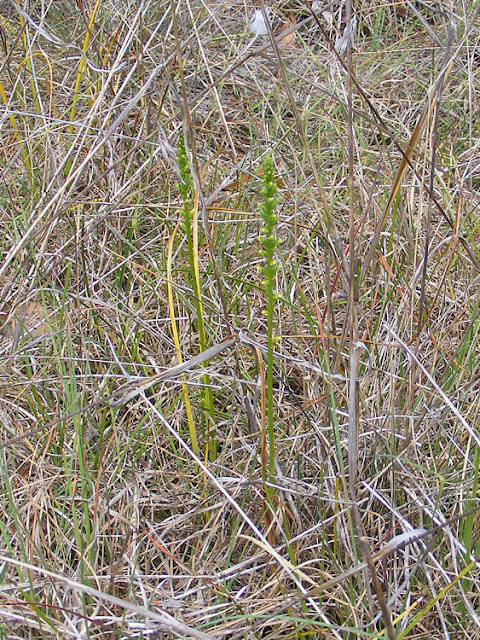 Plants that are accidentally dug up and deposited beyond the colony (even if only a metre, by the actions of rabbits or stock, for example) are one of the few ways a colony spreads. Pasqueflowers have little success at self-seeding. 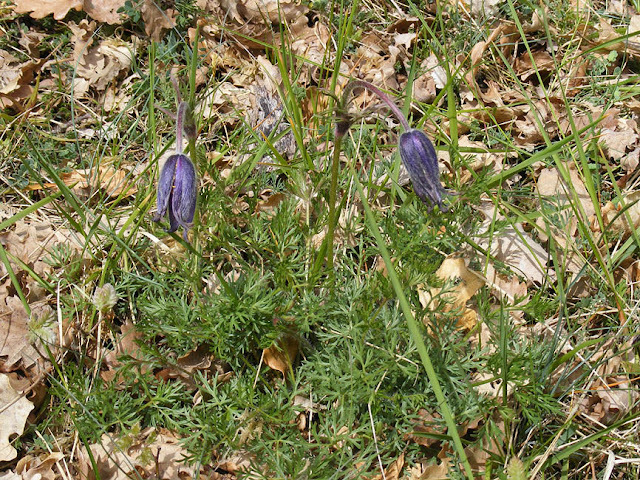 Curiously, experiments in Britain and Switzerland with reintroducing plants have also had very little success, and so it seems that the only hope of retaining this lovely flower is to find some solution to the site management problems. Any reintroduction programme must also take great care to use an appropriate genetic line so as to ensure ecotypes (strains suited to particular conditions) survive. It can be done, but it requires resources and the will to do it from both the nature conservation professionals and the local farmers. Merci, Commune de Boussay ! What Big Hairy Feet You Have!